Research has shown that the habit of drinking milk in your childhood gives long term health benefits in later life. 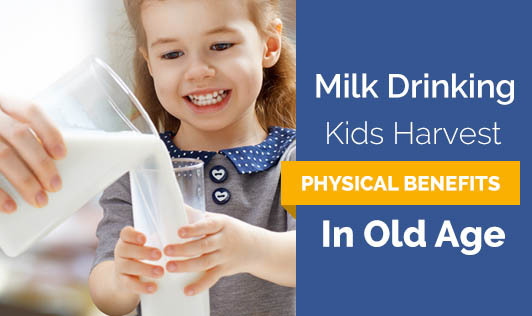 The people who drank milk in their childhood were physically fit and were much less likely to suffer problems with balance while standing or walking. The team of British researchers used historical diet records from two large studies to assess the childhood habits of more than 1,500 men ages 62-86. They measured the impact of diet, specifically milk protein, calcium and fat intake, on current performance and mobility in follow-up. Childhood calcium, protein and milk intake were all associated with advantages in mobility later in life. About one glass of milk a day in childhood was linked to a 5 % faster walking time and 25 % lesser chance of poor balance in older age. The research also found that childhood milk drinkers were likely to be adult milk drinkers, emphasizing the benefits of establishing lifelong healthy habits. 1. Milk contains high quality protein that helps in bone growth and development. 2. It contains calcium, phosphorous and magnesium that helps in bone building, maintenance of healthy teeth and reduce blood pressure. 3. Milk has also been linked to reducing the risk of numerous health problems such as osteoporosis, cancer, cardiovascular disease, type 2 diabetes and obesity. 4. It contains several vitamins, minerals, phospholipids that improve immunity and help in over all development. Consuming milk in the childhood as well as in adulthood is a healthy habit, and has a lot of benefits as mentioned above. Avail all those benefits in your adulthood and make sure your kids drink milk to have a healthy future!